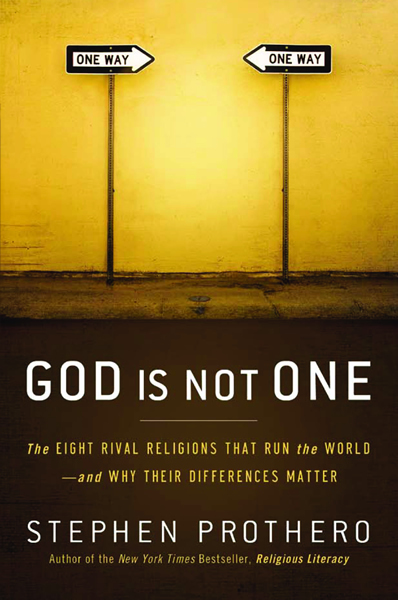 In God is Not One: The Eight Rival Religions That Run the World, New York Times bestselling author of Religious Literacy and religion scholar Stephen Prothero argues that persistent attempts to portray all religions as different paths to the same God overlook the distinct problem that each tradition seeks to solve. Delving into the different problems and solutions that Islam, Christianity, Buddhism, Judaism, Confucianism, Yoruba Religion, Daoism and Atheism strive to combat, God is Not One is an indispensable guide to the questions human beings have asked for millennia—and to the disparate paths we are taking to answer them today. Independent Booksellers extended bestseller, Huffington Post "Religion's Top Ten of 2010", Apple's "Best Books in 2010, enhanced e-books"
Throughout this enormously timely, thoughtful and balanced book, Prothero fears a world blinded to the consequences of religious ecstasy, but he is also mindful that religions have been forces for good as well, and that science has shown there to be evolutionary benefits that come from religion: Indeed, belief and practice may be fundamentally human. Provocative, thoughtful, fiercely intelligent and, for both believing and nonbelieving, formal and informal students of religion, a must-read.